Outside of the Buffalo Bills organization I doubt you can find one person who felt the Bills could go into Minneapolis and beat the Minnesota Vikings, who are one of the better teams in not only the NFC but the entire National Football League. The win by the Bills, who were 17 point underdogs, was the biggest upset in the NFL since 1995. With a surprise win like that, who gets the credit? Obviously the players have to get some of the credit as they were the ones who carried out the game plan. The coaching staff also has to get credit for getting their position groups ready to play. The defense may have played their best game in two years, but it’s my opinion though that the bulk of the credit goes to one person and that is Head Coach Sean McDermott. When a club losses the way the Bills have lost in the first two games of the season, it can be awfully hard for a coach not to lose that team. The Bills lost their first two games by a total score of 78 – 23. Losing by that much can be demoralizing and so McDermott being able to get his guys to concentrate at the task at hand and play the way they did in Minneapolis is nothing short of amazing. The Bills just don’t have the manpower to be a contending team or even a winning team in 2018, but with McDermott at the helm Bills fans can be assured on one thing and that is good times are ahead. The Bills front office is also taking care of that by having a lot of dead money in this year’s cap which will allow the Bills to compete for top veteran players when 2019 free agency begins next March. 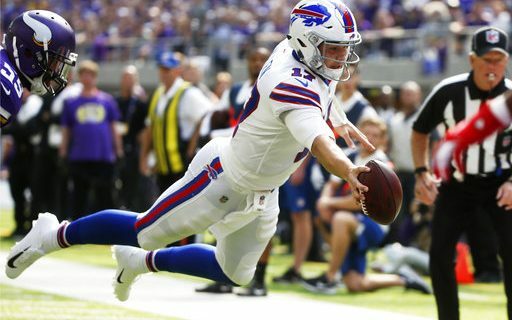 The other big surprise yesterday was the play of rookie quarterback Josh Allen. Allen struggled some last week in the first half of Los Angeles Chargers game but came on in the second half. Yesterday he showed poise and toughness seldom seen in a rookie. Allen’s passing numbers weren’t that great, but it was his overall demeanor that was. Minnesota has one of the more dominant defenses in the NFL. Yet Allen stayed comfortable and passed for just under 200 yards and a touchdown while completing 15 of 22 throws. Quarterbacks in the NFL are taught not to take chances with their bodies yet Allen was throwing his body around more like a running back than a quarterback. I’ve been covering this game a long time and I don’t think I have ever seen a quarterback hurdle a tackle like Allen did yesterday on a scramble. While it may not be the smartest thing he ever does, it showed his teammates that he will sell out for them. That alone was worth the risk of the play. Because of the strength and big play ability of Minnesota offense, I don’t think many fans ever felt comfortable with the Bills lead. That said, credit has to be given to offensive coordinator Brian Daboll for the game he called in the second half. While Daboll took chances in the first half, he played it close to the vest in the second and tried to run clock. With the defense coming up big, that’s all the Bills offense had to do. They key was no Bills turnovers in not only the second half but the entire game. The last bit of credit has to go to the Bill defense. Not only did they have a great game plan, but they executed it to perfection. Granted, the Vikings caused many of their own problems with mistakes but it was the Bills defenders who caused many of those mistakes. Minnesota got 278 total yards passing in the game, but many of these yards came in the second half when they were trying to play catchup. The amazing stat was Buffalo allowed only 14 total yards rushing by the Vikings. The Bills forced three Viking turnovers (2-fumbles, 1 interception) and sacked Kirk Cousins four times. Defensive end Jerry Hughes was not only credited with one sack but an unheard of total of 15 quarterback pressures. That is nothing less than amazing in today’s game. When you figure in the Bills defense was playing short-handed, their overall play was astounding. As we all know, the Bills early season schedule is a killer and next week they stay in the NFC North with a road game at Green Bay. Aaron Rodgers may be playing on a bad knee but he still is one of the best quarterbacks in the game. The Bills are going to need an effort like yesterday to even keep it close.